My thanks go out to Steve and Timi at MX Publishing for my copy of this book! May Undershaw stand forever! It was Sherlock Holmes’ adage that “No ghosts need apply.” For Holmes, the supernatural and such things were against the scientific principles that he lived and worked by. He searched for solid evidence that would explain any conundrum he might come across. These stories deal with the unexplained. There are cases in this novel where the clients insist that their problems lie with the supernatural. They make a report of ghosts, banshees, and other things that go bump in the night. I am not going to do my usual story by story rundown, but I do want to mention several authors. “The Ghost of Dorset House” by Tim Symonds. Kudos for Watson having a larger role than usual! “The Inexplicable Death of Matthew Arnett” by Andrew Lane. Kudos for introducing a friend from Holmes’ childhood! Also for the “impossible murder” story! “The Adventure of the Highgate Specter” by Michael Mallory. Kudos for a haunted cemetery! “The Adventure of the Moonlit Shadow” by Arthur Hall. Kudos for the blending of a Holmes mystery and a beckoning specter! “In the Realm of the Wretched King” by Derrick Belanger. Kudos for a ghost story with premonitions of what is to come! “The Adventure of the Glassy Ghost” by Will Murray. He will understand when I say kudos for the Doc Savage reference many may not get at first! Good show, Will! The story I like the least is “The Adventure of the Pallid Mask” by Daniel McGachey. I find it all but impossible to read a play. Now, the play is well written and I would love to see it performed. I just don't think it works as a short story. I am glad to see this series continue! 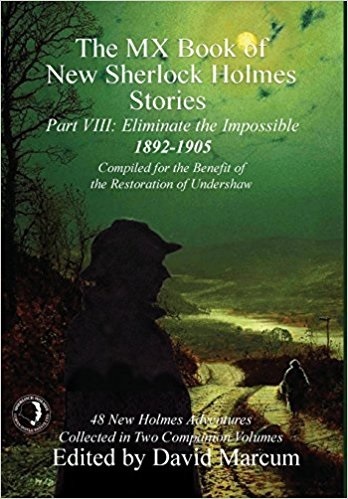 Every volume should be a real treasure to any Sherlock Holmes fan! I give the volume as a whole five stars plus!